Supporting children’s behaviour development. Making ‘behavioural mistakes’ and ‘good choices’ (Part 1): with help from The Rolling Stones and Rob Long! Three terms later a ‘Super Head’ was called in to ‘turn the school round’. That’s how long it can take for a school to go down the tubes when the Governors and Local Authority representatives have ‘made a bad choice’. Santana at Woodstock: a great choice! The worst choice in rock history involved The Rolling Stones. People had been complaining about the extortionate prices for tickets on the 1969 Stones tour of the USA (some things never change). So Mick Jagger decided it would be great to organise a massive open air one-day free concert in San Francisco. It was not long after Woodstock, and the Stones had already headlined a successful free festival in Hyde Park. What could possibly go wrong? Answer: everything. Following problems finding a suitable venue, there were only four days to get the festival ready, which was to be held at a disused speedway racetrack outside the city, at Altamont. The Grateful Dead, who were due to appear at the gig, persuaded The Stones and their ‘management’ that it would be a good idea to ask the San Francisco Chapter of the Hell’s Angels to be in charge of security around the stage. There wasn’t enough time to organize toilets or medical support for the estimated 300,000 people who turned up on the day. The stage was built in 20 hours, and was only a metre high. The whole sorry episode was recorded in the film Gimme Shelter. It was a disaster waiting to happen, and a disaster did happen. In the early evening the Stones flew into a nightmare. 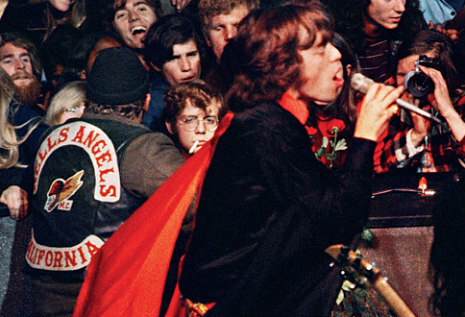 The Hell’s Angels had been paid $500 in beer for their services, and had drunk it all by the time the Stones arrived. Earlier in the day the bass player with Jefferson Airplane had been knocked out by an Angel and thrown off the stage. There was chaos everywhere. The Dead were so scared of the Hell’s Angels that they refused to come out of their trailer, and fled as soon as they could, without playing a note. There was only one thing the Stones could do, and that was to play their set, and be as good as they could be. You can see the terror on the band’s faces, but they made the right choice. Unfortunately someone was stabbed to death in front of the stage: apparently for trying to shoot Jagger. But the Stones had to play on; otherwise there could have been a riot. The band made a bad choice to put on the concert at such short notice, and an even worse choice to hire Hell’s Angels to act as security. Before we rush to judge Mick, Keith and co, we have to ask, ‘What would you have done? ‘They certainly learned from their mistakes, and never did anything for free again. I had an ‘Altamont Experience’ a few years ago, in a small primary school. June is officially Gypsy, Roma and Traveller History Month, and I was invited to help celebrate the culture and lifestyle of the Traveller children attending the school. I was working as a professional storyteller at the time, and had visited many schools with several funny but thought-provoking shows about overcoming prejudice and welcoming people from diverse backgrounds. They were usually well-received. Occasionally I had to make some on-the-spot choices. For example, sometimes a teacher would start to do his or her marking while my show was going on. I would very politely go over to the teacher and whisper, “Can you please stop doing that, because it’s distracting me and the children?” Responses included, “I can do two things at once/ Why should I? / Would you rather I left my class with you on your own?” Maybe it was a bad choice of mine, but I felt that the message conveyed to the children by the teachers’ actions was, “You go on and listen. This is not important to me.” This only ever happened when the Head was not present in the hall, so when I mentioned it to them later, they were always really apologetic and spoke to the teacher involved after I had left. The TAs asked the Head of Key Stage 2 (who as it turned out was in charge of the school because the Head and Deputy were at a conference), “Is that all right, Miss X, because you told us to put the display up?” Miss X walked out of the hall. One of her teacher colleagues rushed out after her. The children looked a bit nervous. I carried on with the show. Five minutes later the two teachers returned. Miss X had a very red face. She had clearly been crying (with rage, as it turned out). As I continued with the show, three teachers sitting at the back glared at me and one even gave me the ‘thumbs down’ sign. The children enjoyed the show, and I was set to lead storytelling workshops in the afternoon. As I was packing up during lunchtime, the three teachers who had been glaring at me came to see me. They were very disappointed at my attitude, as I had usurped their colleague’s authority and made her look foolish in front of the children. I had a choice to make here. (What would you have chosen to do?) I apologised. Would you have stayed on in the school to do the workshops? There was a pair of wild horses on my shoulder trying to drag me and my resources out to my car and make me immediately drive away from that school. I stayed. The first two workshops went well, though the class teachers sat stony-faced and wouldn’t join in. When the Year 6 class came in for their workshop, there was no class teacher with them. The children told me that their teacher was in class, and they were to go and get her when the workshop had finished. What would you have done? I went to the class and told Miss X that I couldn’t run the workshop without her being present. She refused to come in, but sent a TA. When we had finished the workshop, she came in and said loudly and pointedly to the children, “Right, everybody back to class to do some real work.” What would you have done? I went to Reception and read the children a story called Frog and the Stranger, by Max Velthuijs. The Reception teacher was very nice to me. I left the school quietly. The next day I did exactly the same shows in a small school in a nearby town and we all had a great time. I was treated with great respect, and we did loads of fun follow-up work, including making traditional wagons, painting and writing stories. Now that was nothing like the dreadful experiences in San Francisco, but it was an awful day. Luckily the children were able to rise above the adults’ behaviour. Maybe I should have allowed the TAs to carry on putting up their display, but my feeling was that I was there to help celebrate the culture of a minority group, and out of respect to them I wanted to show that we should all take part respectfully. Maybe it was a bad choice of mine, and I’m intrigued to know what readers would have done. I’m mentioning all this because an important part of our work is to help children make choices about how they are going to behave. Sometimes this can be a long process: particularly when children have additional learning needs, or have habitually developed negative behaviour. Educational Psychologist and behaviour specialist Rob Long describes children as making ‘behavioural mistakes’. Children make all sorts of errors in their learning in school. We expect this and know that we can use these mistakes to help children develop. When children behave ‘badly’; e.g. by getting into a fight, it can be useful to see this as a ‘behavioural mistake’, and think, ‘What can we learn from this, and how can we help each other to replace negative behaviour with positive?’ The mistake that I used to make was to assume that because a child has been told that he has done something wrong once, he won’t do it again: e.g. ‘Now let that be a lesson to you, so don’t do it again.’ The process of developing appropriate social behaviour takes time and is an essential part of schooling. Rob Long is an inspirational trainer, and his courses and resource books are great to help people like me become more skilled at helping children with their social and emotional development. The Stones never made the same mistakes again. I’m sure they had lots of help from local law enforcement and licencing agencies, and possibly even government agencies like the FBI, to make sure that everyone learned lessons from the disaster. After my ‘Altamont experience’ I always made a point of checking that a member of senior leadership would be present throughout the show, and that all teachers would be prepared to join in. I always made sure I had an Angel looking after me too (my Guardian one). Unlike the Stones, I have decided to retire from showbiz. Three boys who usually cause lots of trouble, but have learned to play together nicely. PS Loved the Santana clip; I met my husband of 32 years at a Santana concert at Alexandra Palace, London. You are so right about story sessions, and the need for all adults to be focused. This is an important message from my ‘Bring Storytime to Life!’ day course. I am writing a post for Early Learning HQ about this very subject. One nursery school I did training in now has a sign on their front door reminding visitors to try not to ring the front door bell between 11.30 and midday, as children will be having a group story then, and all the children and adults will be busy focusing on a story. I have a cousin who is a financial advisor, and he visits families at home in the evenings. He knows not to try to book an appointment while Eastenders or Corrie is on TV, as his prospective clients won’t be able to concentrate. It should be the same for storytime! Your comment about storytime inspired me to write a blog about this subject. It can be found at http://www.earlylearninghq.org under Michsel Jones, where I have a regular blog spot. I have worked extensively with settings, developing group time, and this was a big part of our work with Every Child a Talker. PS Santana at Ally Pally, and you found a husband! That must have been a life changing evening!!!! A friend of mine saw The Grateful Dead at Ally Pally, but the acoustics were so bad that they sat outside and heard everything much better! I wanted to see Santana at Wembley in 1976, with the Dead and lots of other West Coast bands, but the gig was cancelled due to poor ticket sales. That’s when I realised that times had changed! Michael, you raise an important professional development issue concerning how educators have opted to use their time during your workshops. Educators can be preoccupied with “staying on top” of their workload and mistakenly see a guest speaker as giving them “time off” to get on with jobs. By making that choice, educators miss a rich opportunity to learn how to build on the workshop content and incorporate new approaches into their teaching. “Busy work” has to be minimized so that educators give priority to the really important aspects of their jobs which are all about supporting children’s learning by listening to them, responding to them and extending their knowledge and understanding. Thanks Heather. Yes, I know that teachers have a lot to do, but we all have a duty to be good role models and can do so by showing respect. Most do this, and also get involved with planning follow up activities. Cheap jibe you say. Trying(badly) to do a Michael Jones here. By saying a lot of people’s focus, engagement, willingness to participate, abilty to see what is going on in a room, social dynamics etc is perhaps mainly influenced by sensory and environmental factors.Background noise being one of the biggest distractors available. At our school we have been very aware for the last few years about the sensory needs of our pupils and students, particularly those with a diagnosis of ASC. In(very) short, what sensory experiences pupils might be seeking and those they might be trying to avoid: In the case of those with quite deeply rooted sensory modulation issues, in quite an extreme way. (eg. rushing off to smell a complete strangers armpits, or thumping the nearest available person if an unexpected noise occurs). “Behaviour” occurs often as a result of sensory experience (input and output) which doesn’t appear logical or triggered to those(adults) who have appropriately moderated sensory “diets” That “behaviour” in the face of well-planned, appropriate, ostensibly engaging activities can be very difficult to manage especially if the person presenting it either has no way to communicate what it is they can’t bear or desperately need, or if they are in the care of, or receiving education from, adults who have no knowledge of what is going on for them sensorily. Ahem. “Altamont Primary”…. hilarious. There probably is an Altamont High School in California, just because it’s a place.I would love to hear a list of hilarious school names. I happened upon Dog Kennel Hill Primary in Camberwell the other day. Back in the 70’s my Uncle threatened to rename the school he had been newly appointed headteacher of, to “Bertie Clack Middle School” He didn’t; it’s still St Lukes Primary school. School names: I have theory that the majority of Special Schools in England have rural names. My Theory continues that this represents an unconscious and unpleasant societal undercurrent / desire, for those with special needs to be placed on the outskirts of towns where they are less visible. That joke about the Grateful Dead is spot on, as are your comments about sensory issues. Some of the behaviours that children with severe learning needs exhibit seem totally bizarre and unpredictable. However they may make more sense to us if we were able to see the world through the eyes of the children. They are trying to make sense of the world, through a very distorted set of sensory perceptions. I found the ideas of Dave Hewitt and those working with Intensive Interaction to be very helpful, where for a short time we mirror exactly what the youngster does, without any interpretation of what they are doing. PS the season of festival-related posts is coming to an end, but I have one more in the pipeline! Interesting comment about background noise Tim. Today I had a short session with the children about road safety (following an incident that occurred when a child was with their parents). We are very close to the M25 and I started off by asking the children to tell me what noises they could hear outside. Nobody mentioned the constant hum of the traffic on the motorway! Does this have any effect on children’s behaviour or hearing? Yours front stage, Reading Festival, with a complete set of waterproofs. Shows my age. Respect and awareness of companiable learning come to me – and how easy it is for people to opt out of a companiable activity in the current trend of fitting so much into a day. I totally think you were right to stand your ground in that hall – putting up a display was not respecting what you were doing and actually having a focus to join staff and children can be quite rare in school (I think) and that sense of unity is one of those invisible quality times. Going on a school trip similarly puts staff and children together in a different way. As to the question of hearing versus listening, I have been very interested by this the last few months and it took me about thirty seconds to identify the sheep bleating in a fairly distant field that another member of staff was asking the children to listen for. (Though of course it may be my advanced years!!) How much do we miss either through familiarity or narrowed expectation? It goes back to your recent blog about song lyrics and our amazing versions of them in a way. And I like the ‘behavioural mistakes.’ We should stand up for what we believe as you did, but it took me many years to improve my confrontational style of doing so at times! Yes, I certainly felt very confrontational at the time, and afterwards I did wonder if one member of staff was playing some kind of ‘mind game’ by trying to show everyone that she was in control. Unfortunately this does happen in organisations, including schools and settings. When you are at the front of a big group of children, it can be very difficult to know how to react. Comedians get this all the time, and build responses to heckling into their act. However teachers and practitioners do have a responsibility to act as role models to children, by showing respect and a certain amount of maturity in the way they treat each other. Luckily I went to a school the next day where the head teacher was totally on board and the children produced amazing work. Tim has certainly introduced some interesting ideas about listening. It is part of maturation for children to be able to tune out background noise, but maybe in the process over the years we stop noticing sounds around us? We are very lucky to work with young children, who keep reminding us about what is important!